Looking forward to real snow now. 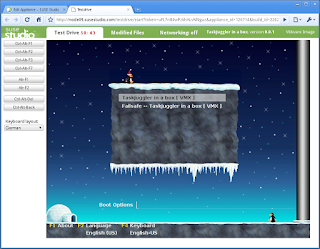 By the way, did you notice that you can stop the snow in SUSE Studio? We released support to build openSUSE 11.2 appliances in SUSE Studio today. It took a bit of time to sort out all issues and do proper QA, but now it should work fine. If you find remaining problems please let us know. Many of you will want to migrate existing appliances using an older version of openSUSE to 11.2. In many cases it's probably not a lot of work to recreate the appliance from scratch with openSUSE 11.2 as a new base, but that's clearly not a good solution for all cases. So we are working on a way to automatically migrate appliances to a newer base system. We'll let you know when it's done. And now for something completely different: It's snowing in SUSE Studio land.